CAGAYAN - After visiting the Our Lady of Piat Basilica in the town of Piat, we headed back to Tuguegarao City to visit the Tuguegarao Metropolitan Cathedral. Since we were feeling hungry, we stopped by Gretchen's Noodle House to sample Tuguegarao's famous Pancit Batil-Patong (also spelled Pancit Batil-Patung). We ordered the Gretchen's Special (PHP60.00) which is enough to be a meal in itself. Pancit Batil-Patong is basically made of miki noodles (egg noodles), cooked with a special sauce, ground pork, cara beef, vegetables, and made extra special with chicharon bits and a fried egg on top. This dish is traditionally served with a small bowl of egg soup. Depending on your taste, you may season the batil-patong with a sauce mixture of calamansi extract, soy sauce, vinegar and chopped onions. Everyone in Tuguegarao has his/her own favorite panciteria, and they would claim that their favorite panciteria serves the best batil-patong in town. So, there is really no single answer to the question, Where can I find the best batil-patung in Tuguegarao? Thus, this visit to Gretchen's Noodle House was only the beginning of my search for my favorite batil-patong. 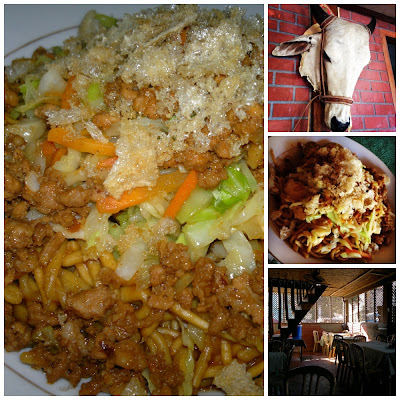 Gretchen's Noodle House is located in Tuguegarao City, at the corner of Magallanes and Zamora Streets, approximately 500 meters south-west of Tuguegarao Metropolitan Cathedral. Anywhere within Tuguegarao City, take a tricycle (PHP10.00 per passenger) and tell the driver to bring you to Gretchen's. The driver may pick up other passengers along the way. Always pay the exact amount. Tricycles do pass infront of Gretchen's Noodle House. Take any tricycle and tell the driver your drop-off point. Regular fare within Tuguegarao City is PHP10.00 per passenger. Always pay the exact amount.